This past Saturday I went to the Hobby Lobby. It is one of my favorite stores and I can browse there for hours on end. But the main reason for my trip this time was so my daughter could get some more beads for her jewelry making hobby. I hadn't planned on buying anything for myself and I almost made it out of the store empty handed, but that quickly changed when I got to the fabric section. Now, I didn't get any fabric, and I wasn't even tempted, except for that pink paisley which I just patted and walked away from. Instead, I found something I felt I couldn't live without when I went to the discounted notions wall. Hanging near the bottom I found a cross stitch kit on sale. 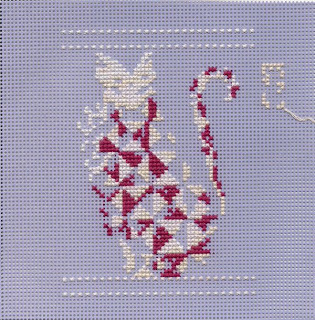 Why it was in the fabric section instead of the cross stitch section I don't know and normally I am not tempted with a cross stitch kit, but this one had pretty beads in it and it was a picture of a quilted cat named Scarlett done by Jim Shore. It was discounted from $15 to $5. So I snatched it and her friend Petunia up and headed to the cash register. I halted progress on the three current projects I am working on and have only been cross stitching for the past couple days. I am so excited to finish this cat that I do believe it will be one of my few projects that gets started and finished without me doing any other projects in between. Now if I could just do that with all my projects and not get side tracked with new ones, I might not have so many UFO's. 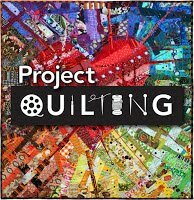 I see why you were tempted....cats,quilting, crosstich.....and cheap....a must have.